But Food Not Lawns doesn't begin and end in the seed bed. This joyful permaculture lifestyle manual inspires readers to apply the principles of the paradise garden--simplicity, resourcefulness, creativity, mindfulness, and community--to all aspects of life. Plant "guerilla gardens" in barren intersections and medians; organize community meals; start a street theater troupe or host a local art swap; free your kitchen from refrigeration and enjoy truly fresh, nourishing foods from your own plot of land; work with children to create garden play spaces. Heather C. Flores, a certified permaculture designer, holds a B.A. in ecology, education, and the arts from Goddard College. She offers environmental landscape design and consultation services. She is an author, artist, musician, community activist and farmer in Oregon. Her website is www.heatherjoflores.com. 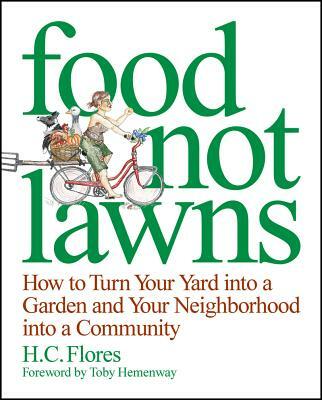 For more information about the Food Not Lawns movement, visit www.foodnotlawns.com.